Trinity Designs: You put da lime in da coconut and shake it all up! You put da lime in da coconut and shake it all up! At least that's what my daughter said when she saw this card. (with an island lilt) :) Apparently that is the new "phrase" on the playground at school - go figure! Anyway, this cute card was designed for me last week by my downline Lauren when I was too sick to do anything to prep for my stamp camps that are going on today. It was so cute, I had to share it with you - it helps me think about my upcoming cruise too! Oh, my, Bermuda is calling my name today! 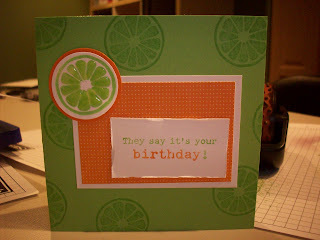 The card is really simple, using the citrus slice from Tart and Tangy in the Occasions Mini catalog. Just random stamp it in Green Galore on Green Galore cardstock and once on Whisper White. Punch out the single lime and mount it on a circle punch of Pumpkin Pie. Lauren applied Crystal Effects to make it 'juicy' and dimensionaled it to the corner of the layered Whisper White and patterned paper. This is one of the designs from the Summer Picnic paper, also in the mini catalog. The sentiment is from It's Your Birthday and is markered in Green Galore and Pumpkin Pie. She used the distressing tool from the Cutter kit on the edges. Very cute, but very simple!